WARSAW, Poland (AP) — The mayor of Warsaw banned a march that radical Polish nationalists planned on the centennial of Polish independence, saying Wednesday she made the decision from security concerns and to curb "aggressive nationalism." Hanna Gronkiewicz-Waltz said she wanted to put a stop to extremist displays that have appeared during the past decade at far-right marches that have drawn tens of thousands of people on Poland's Nov. 11 Independence Day holiday. At a march in Warsaw last year, some nationalists carried racist and anti-Islamic calling for a "White Europe," and white supremacist symbols like the Celtic Cross. The event drew international criticism, and lawmakers in the European Parliament called the participants "fascists" — a label that infuriated the Polish government. "This is not how the celebrations should look on the 100th anniversary of regaining our independence," Gronkiewicz-Waltz said at a news conference. "Warsaw has suffered enough because of aggressive nationalism," she said. She noted that the chief organizer of the Warsaw march is a leader of the National Radical Camp, a group she has appealed to the justice minister to outlaw. That organization traces its roots to an anti-Semitic movement of the 1930s. The bans followed signals that radical far-right groups planned to travel to Poland for Sunday's march in the capital. Mass walk-outs by police officers in recent days also raised concerns that clashes between participants and counter-protesters could get out of hand without officers to intervene. The authorities in the two cities are likely to be praised by some for trying to push back against extremism. But they also face the risk of being accused of trying to suppress free speech as well as encouraging the far right even more. Krzysztof Bosak, the deputy head of the National Movement, a far-right party that is also a co-organizer, said the march would take place despite the ban, which will be appealed. In Wroclaw, a key organizer, former priest Jacek Miedlar, also vowed to defy the ban there, writing on Twitter that "no leftie or Jew will forbid us from this!" 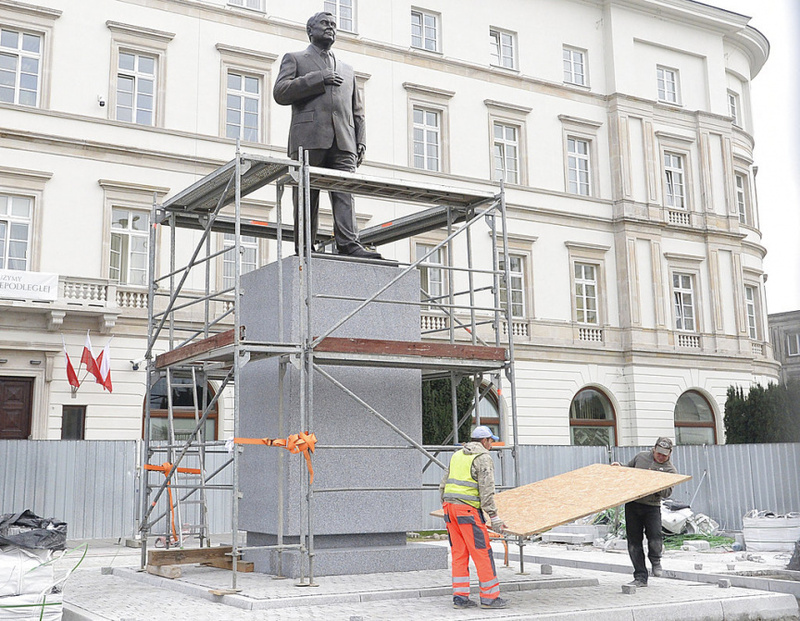 Meanwhile, a controversial statue of late President Lech Kaczynski was installed in a central Warsaw square ahead of its weekend unveiling as part of the centennial celebrations. Authorities in Warsaw's local government — in the hands of the centrist political opposition — opposed the statue and its central location. Pro-government provincial authorities were in favor. It's a clash playing out in the courts even as the 7-meter (23-foot) statue went up.